There has been a thriving community in the Carmarthenshire village of Bethlehem since the Stone Age. Bethlehem lies above the south bank of the river Towy in a landscape steeped in the ancient past and mythology. It is an area that fascinates and enchants with a sense of history going back through the age of saints, Romans and the very earliest peoples of Europe. Dominated by the huge Iron Age hillfort of Garn Goch, with steep stone ramparts covering the craggy hillside, the village has evidence of settlements dating back over 6000 years. The Old School was built in 1864 and closed in 2000. At its peak in the 1880's it had 76 children in two classrooms but by the end there were only 6. A community association was formed in 2000 and in 2004 the building was bought from the council and Yr Hen Ysgol was refurbished with a Big Lottery Grant in 2008-9. The kitchen is well equipped and all facilities are accessible. For long-term users, lockable storage cupboards are available. There are several parking spaces next to the hall. Wheelchair access is at the front and at the back. 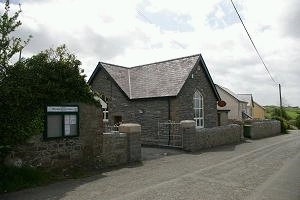 The Old School, Bethlehem, Llandeilo SA19 6YH. Charity number: 1119470. The building has a hall and a meeting room as well as a large kitchen and toilets with facilities for disabled people and changing babies (in the nappy sense). It is centrally heated and has solar panels provided by the Carmarthenshire Energy Agency. The hall dimensions are: 8.4m x 5.2m (27.5ft x 17ft). The well-equipped kitchen has all the normal cooking and preparation facilities. There are two 'playgrounds', one of which can be used for parking if necessary. Bethlehem is signposted at the mini-roundabout at Ffairfach (A483) and just outside Llangadog (A4069) at Felindre. Yr Hen Ysgol is located in the village of Bethlehem at the top of the hill on the junction with the road to Garn Goch (look for the Post Office which uses a room in the building).